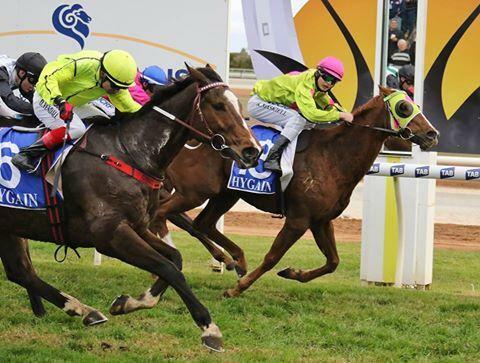 Muchos Respectos broke through for a nice win in a 1300 metre BM78 on the first day of the Swan Hill Carnival after a long time out of the winners circle. He was nicely rated in front by young claiming Tasmanian Apprentice Kyle Maskiell to hang on and win by 0.1 of a length. Kyle is a promising young rider and is the younger brother of Jason Maskiell who was the last jockey to win on Muchos in Darwin in July 2013. The ever consisent Duaneo, also ridden by Kyle ran 4th over 1300 metres. Grand Frenzy was the best of the three runners on the second day of the carnival with a third placing over 2100 metres. Our first runner of the final day of the carnival was Aberfeldy who acquitted herself very well again to run second in a 1600 metre maiden, beaten 1.5 lengths. She will now go for a well deserved spell. Let's Be A Star ran a brave second in the Swan Hill Cup over 1600 metres. She travelled strongly behind a wall of horses, and was presented at the right time by Jackie Beriman. Unfortunately the horse to her outisde had too much momentum and won by 0.1 lengths. Youbolt was our final runner with a pleasing run over an unsuitable trip, finding the line strongly over the concluding 150 metres. He was 8th out of 12 but only beaten 2.9 lengths.